The Episode starts with Archie being on the way. She thinks Neeraj didn’t take me to idol, but I found Pavitra, what’s happening. The ambulance stops. Archie sees the crowd. The man tells her about finding Revati. Archie gets shocked seeing Revati. She asks what happened. The man says she fell down the cliff, strange nothing happened to the idol. Archie says she is my aunt and even this idol is ours, help us take her to the ambulance. She takes Revati. She picks the idol. They leave. Vandana looks on and thinks I lost the idol, I have to get the idol somehow. Rajmata thanks Sia for getting her clothes. The old lady gives them food. She asks them to stay here. Rajmata says you maybe the maid of the house, if your boss knows this. The old lady says no, I m the owner of this house. Rajmata asks Veer to have food. He refuses. He says I want to talk to Archie, if you are saying truth, why am I not remembering things, why is this happening to me. Rajmata says you are absolutely fine, you forget things, Kaal Bhairav is making you do this. Akshay asks Archie not to worry, Revati will be fine. Vandana tries to hear. Archie says I don’t know how did Revati get the idol, Pavitra took Revati’s name before dying, did Revati do this, whom shall I believe. Vandana thinks did Revati get conscious, I have to go and see. Thakur asks doctor about his son. Doctor says I have done his operation, we are trying, its all in Lord’s hands now. Vandana goes to Archie and asks how did Revati get the idol, where was she going, how did she fall in the valley. Archie says I don’t know, Pavitra was taking Revati’s name and asked me to save her child, did anyone kidnap her child. Vandana is glad that Pavitra didn’t take her name. She says my secret will be a secret until Revati is unconscious. She sees Revati and says I can’t let you come to senses. She sings. A young lady comes and scolds the old lady. She tortures the old lady/her Saas. The old lady begs her to leave her and cries. Rajmata and Sia look on. Rajmata says if Veer sees this, he can get possessed again, Sia go and sit with Veer, make sure that he doesn’t come here. Sia goes. The young lady beats her Saas. Rajmata feels bad. Vandana comes to Thakur and asks couldn’t you kill Pavitra. He says you couldn’t kill Revati. She says I can kill Revati any time. He says its imp, but more imp thing is to make the idol reach Brahmanand. Vandana says yes, we have to do something, Archie is protecting the shield, it will be fun to do this. The old lady tells Rajmata how her Bahu troubles her and acts good when her son comes back. She shares her pain. Veer hears their talk. Rajmata asks her to tell everything to her son. The old lady says I don’t want to trouble my son by telling all this. Her Bahu looks on and gets angry. She calls police and informs about Veer and others hiding in her house. Veer gets angered. He turns into Kaal Bhairav. He goes to punish the lady. He catches her. She tries to get free. Archie asks doctor how is Revati. Doctor tells her that Revati is in coma. Archie gets a call from Brahmanand. She says I don’t know any Brahmanand. He threatens her about Pavitra’s child. She says don’t do anything to the child, who are you. He says hand over the idol to me, remember just do whatever is told to you. He coughs and wears the oxygen mask. She checks the number. Archie tells Vandana about Brahmanand’s call. She says he wants the idol. Vandana says we have to take idol to Kashi. Archie says but we can’t leave Pavitra’s child like this. Veer punishes the bahu and says your sins should be washed first. The young lady apologizes. He scares her more. She begs to the old lady to save her, she won’t do anything again. Rajmata worries seeing Veer. Police reaches there. Inspector asks Veer to surrender himself. Sia says police has come, what will we do now. 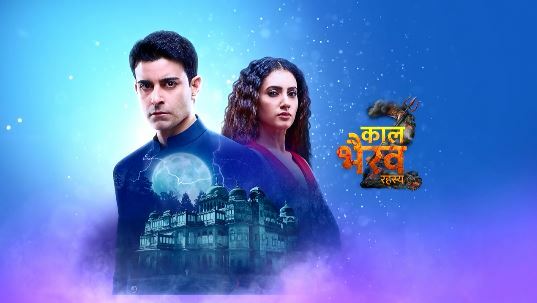 The post Kaal Bhairav Rahasya 2 11th March 2019 Written Episode Update: Veer punishes a lady appeared first on Telly Updates.